I’m so excited to be contributing to Merry Mag this year! It’s an inspiring collection of holiday recipes, decor, crafts, and diy’s to get you excited about Christmas. 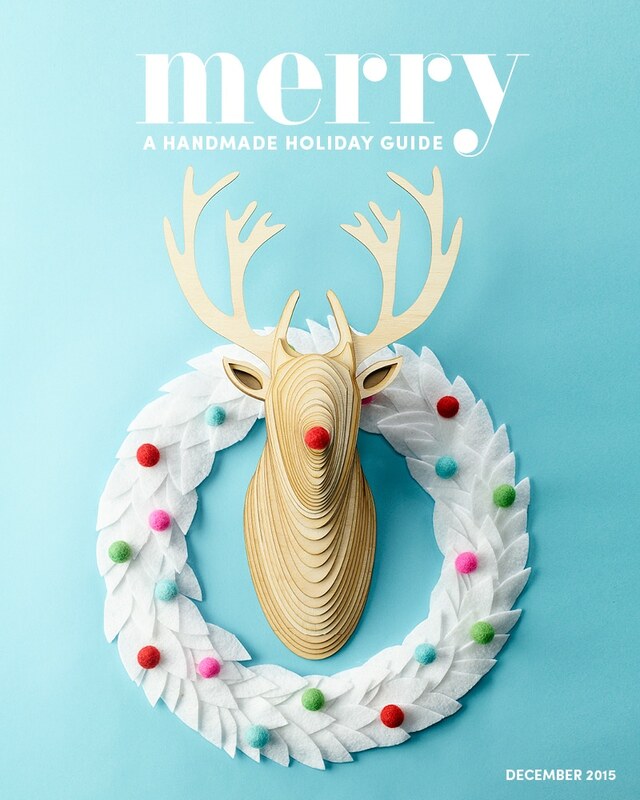 Follow along on social media with #MerryMag Special thanks to Melissa at The Sweet Escape for putting this all together, such a special project to be a part of. 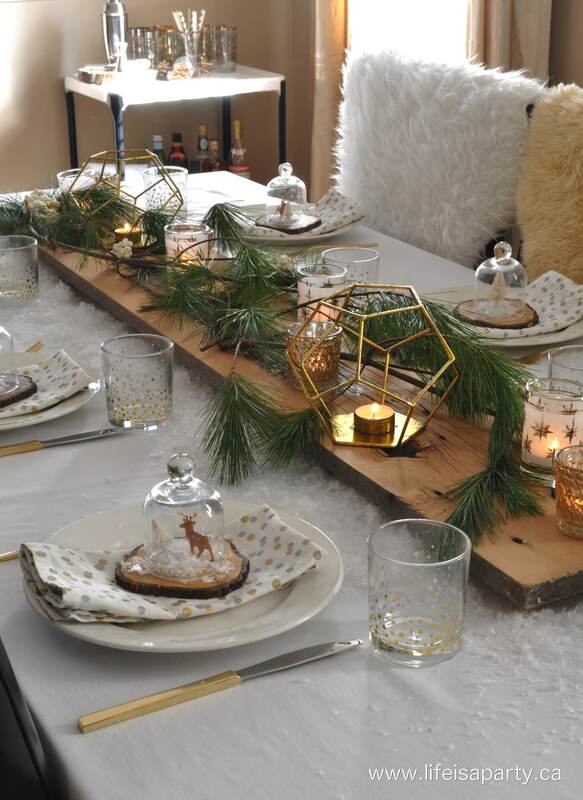 My project for Merry Mag is a pretty Rustic Snowy Table, perfect for Christmas. I’m going for a Scandinavian inspired look this Christmas so I piled lots of soft sheep skins and pillows on the chairs. I wanted to keep things feeling light and bright, so the white tablecloth worked well as the foundation for the table. 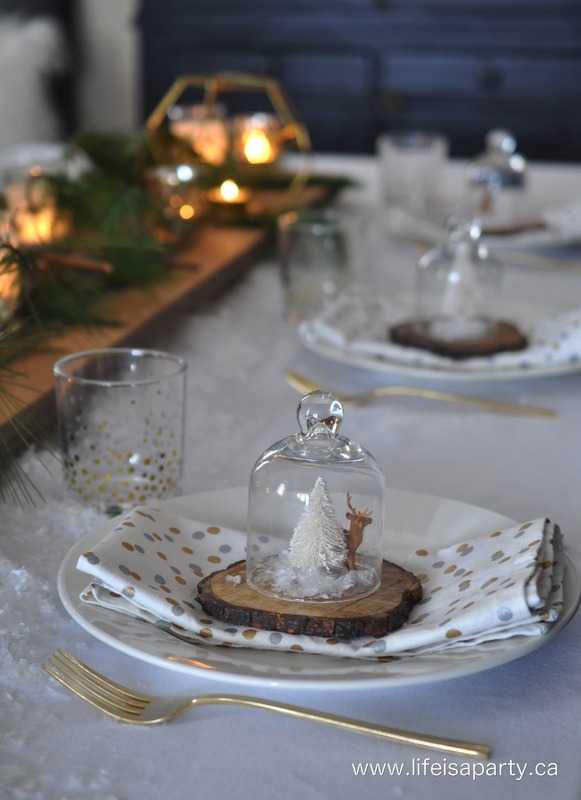 I wanted to create a layered effect so on top of the tablecloth, I added faux snow, and then this amazing old piece of hundred year old hemlock. salvaged from an old barn. 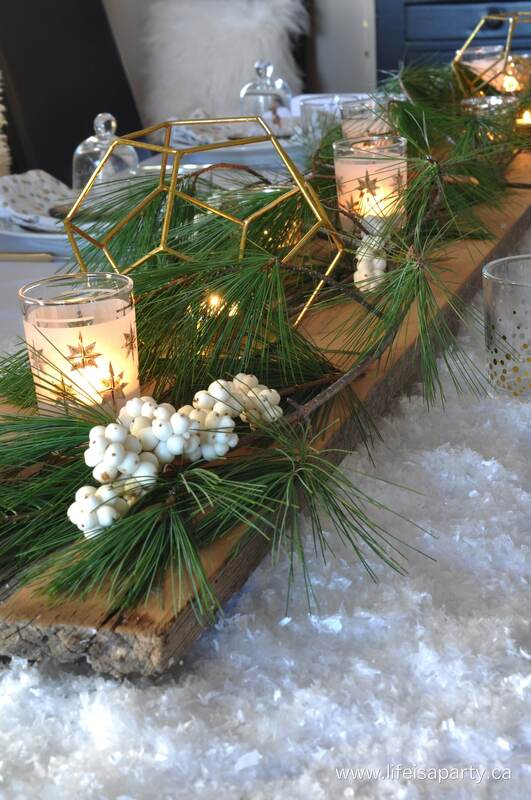 On top of the plank table runner, I laid some boughs of white pine, and a few sprigs of pretty fresh snowberries. 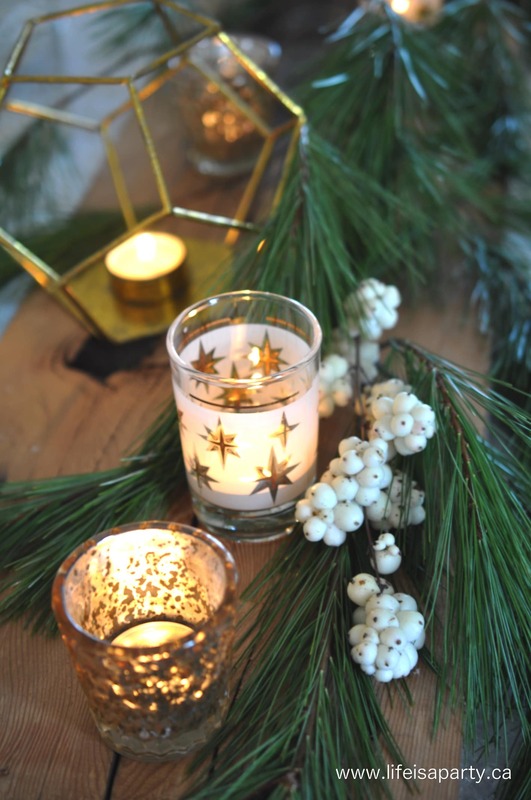 I used some pretty gold candle holders, since Christmas is the season to celebrate the light. The patterned glasses are some vintage juice glasses turned into votives. I love the mix of the traditional gold, and vintage pieces, with the more modern geometrics. 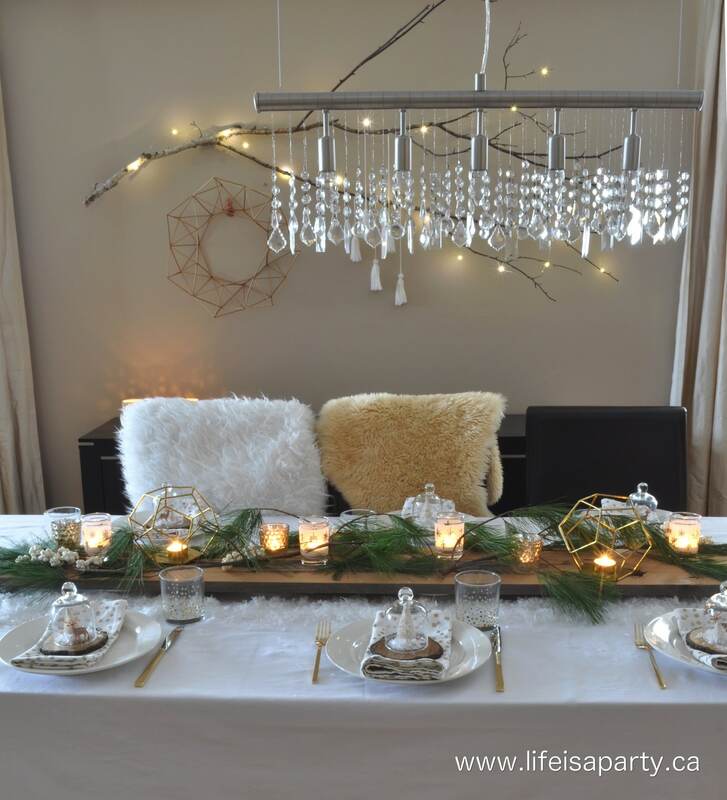 I set the table with simple white plates, and pretty gold cutlery. The dot napkins and glasses add to the feel of snow. 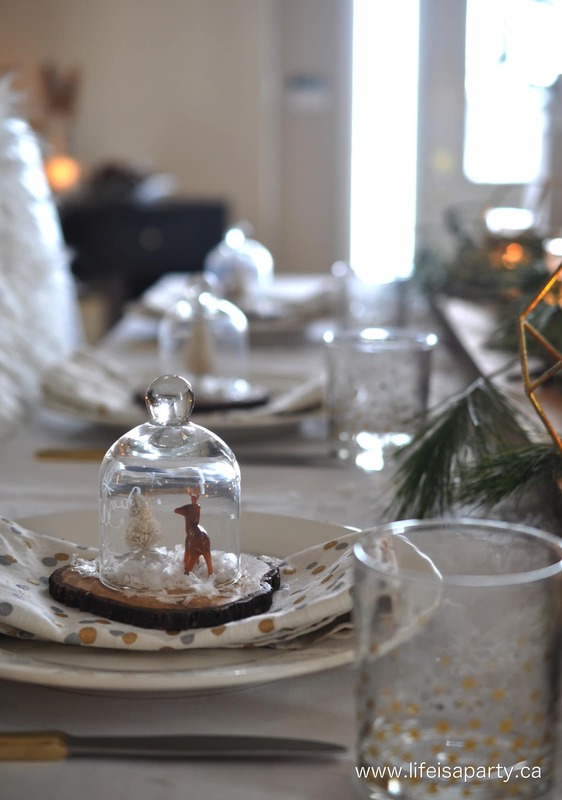 My favourite detail of the table is the pretty little snow globe inspired place markers. I started with some rustic wood coasters. I added some more faux snow, and a little Christmas tree to each one, a few also got a sweet little plastic deer from the craft store. On top of each little scene I placed a mini cloche -from a set of cupcake holders that I had. 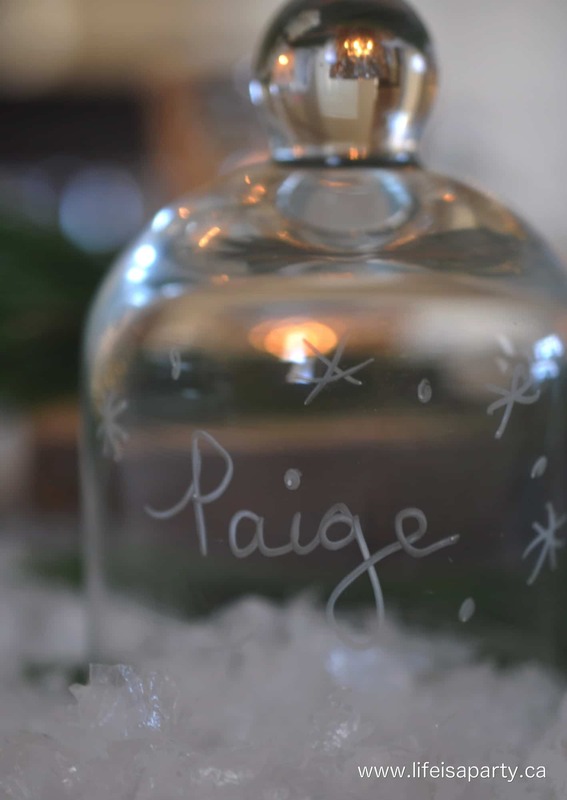 Each little “snow globe” was turned into a place marker, by adding each guest’s name, and a few pretty snowflakes. I used a Crayola Window Writer marker in white to add the detail, and it washed off easily afterward with soap and water. I love how subtle and pretty the names turned out -and you could customize this idea to any message, and any colour scheme, since the markers come in a whole range of colours. 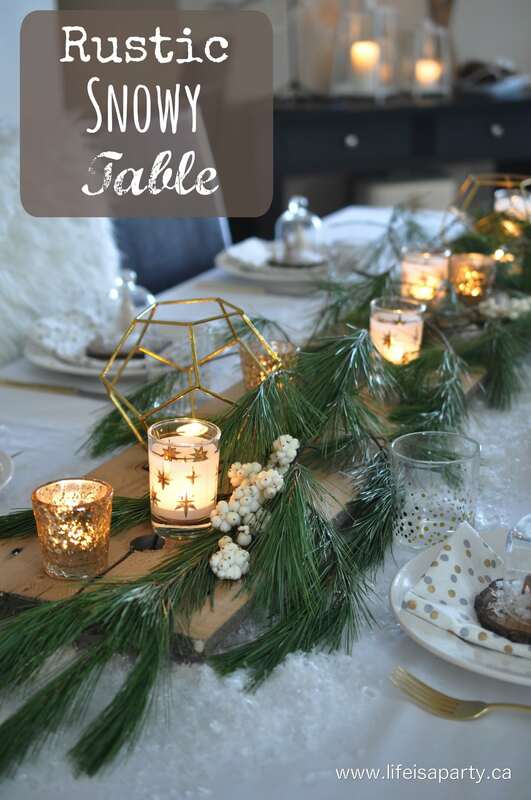 I love how simple and pretty the table turned out, great for Christmas, or as just a winter table. Perfect for a cozy night in enjoying the warmth of good food, good drink, and good friends. 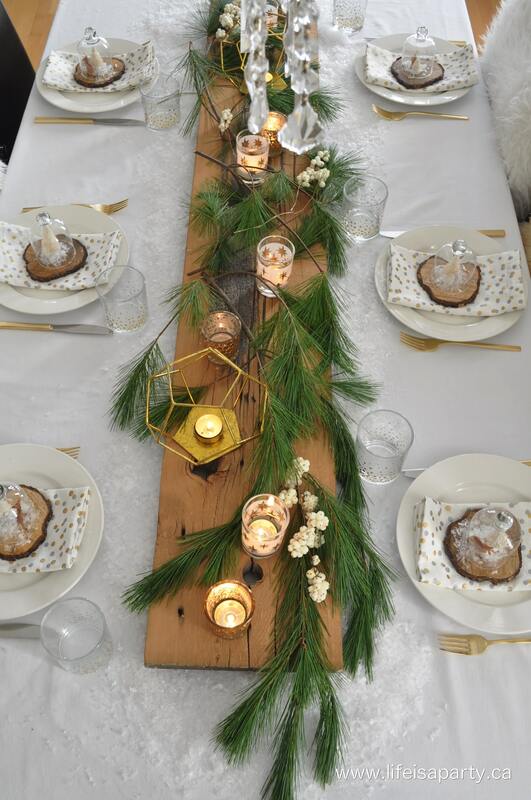 With a Rustic Snowy Table like this, life really is a party! 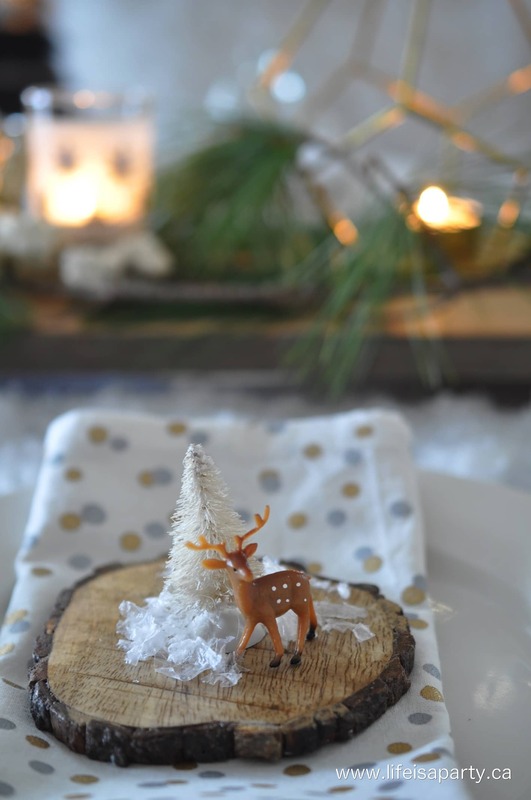 Be sure to check out lots more amazing holiday ideas at Merry Mag! Oh, I love your snowy table Dannyelle! That salvaged plank is genius – it brings such life to the table and what a conversation piece. The mini cloche are too adorable. Wishing you a Merry Christmas.